Rethinking “scaffolding” — one of the most fundamental and unexamined parts of teaching. “Scaffolding” is a technical word teachers and educators use to denote the order of concepts and learning activities so they make more sense to students. The idea is if concepts are ordered properly fewer students will get stuck and left behind and everyone on the whole will learn more in less time. If you tried to teach polynomial equations first, the assumption is you would just confuse most or all the students. Common sense (and the lived experience of any young teacher who teaches things out of order) suggests that it is better to start with more fundamental and less abstract concepts and then synthesize them into more and more abstract concepts. In almost every case, scaffolding is done like the example of algebra above. This could be called Semantic or Analytical Scaffolding since the focus is on building up the parts of the whole piece by piece, and always going from lower abstract concepts to higher abstractions. David Perkins gives this overemphasis on building up from fundamentals the delightful name Elementitis in his book Making Learning Whole. I’ll use that word going forward. Elementitis is so common and follows such obvious common sense that scaffolding this way is practically universal, and is universally taken for granted to be the way to scaffold information. But what if there is a better way to do scaffolding? What if we could get a lot more learning done in less time just by reordering the content that we teach? What would be the guiding principle of an alternative to elementitis scaffolding? Instead of defaulting to elementitis, we can use recent research into developing student interest to revamp the standard of scaffolding concepts and learning objectives. Suzanne Hidi and K. Ann Renninger’s recently published a paper entitled “The Four-Phase Model of Interest Development”. The four phases can be used to recreate how we as teachers scaffold information to optimize developing a student’s interest in a topic, not just their knowledge and mastery of it. 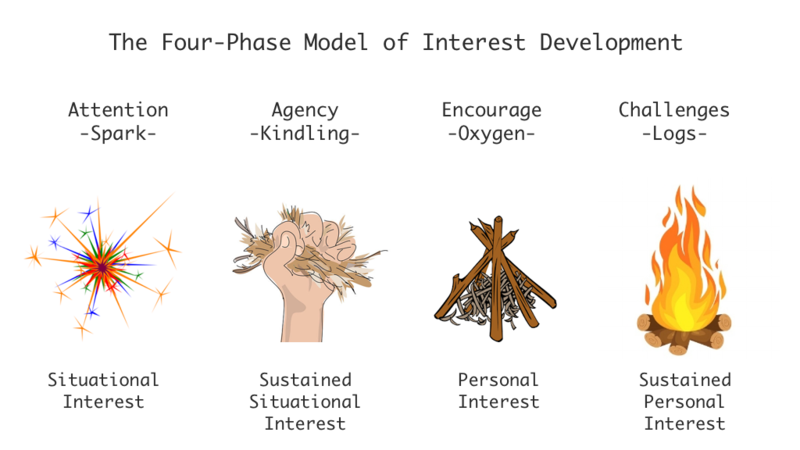 The four phases begins with someone completely oblivious to a concept or domain; the initial phases create a “situational interest”, and then transition that interest to a “personal interest”. *Spark* Attention — In order to start anyone down the path of interest, we have to spark their interest. This is the part of interest development that is already done somewhat well by good teachers. They know they have to hook students with something interesting from the beginning. Some call it the Hook. This phase only lasts a few minutes at the beginning of each class. *Kindle* Agency — The next phase acts like kindling to the spark of Attention. An educator must now tie the concept or learning objective directly to the learner’s sense of agency or being able to do or achieve something meaningful to them in the world. Here already, we’ve departed from even what many good teachers do and are instructed to do. See below for an example using algebra. This phase takes a few minutes after you’ve caught their attention. *Oxygen* Encouragement — Once the tiny spark of a personal interest has caught in the kindling of the Agency phase, it is important to feed the fire kindling and then small logs. This means lots and lots of encouragement. This phase can be challenging and rigorous, but the stakes should be very low and students should be allowed to retreat to their comfort zones. This phase of interest development is longer than the first two and is where students develop initial knowledge and mastery in a topic. *Logs* Challenges — Once the fire is self-sustaining, its time to feed it some big logs. In this case, “big logs” means high-stakes challenges and strong critical, constructive feedback. These logs would have smothered the fire in an earlier phase, but now the fire is strong enough to take them. High-stakes testing (which happens every 2–3 weeks in a traditional school) is an example of an interest-smothering log. This phase is the longest phase and is where a student heads towards expert mastery. Attention: Large sums of money are inherently interesting (hence why bank robbers and the lottery are so interesting) so start by putting an equation for the federal budget on the board and show the cool infographic from the Obama era White House. Agency: Equations provide agency to anyone because they can build models to optimize for things they want, so assuming students are teenagers who like social media, you could have them create equations for how to get more likes on social media, e.g. So it turns out that scaffolding is more like building a fire than building a building. But why should we think that scaffolding for interest will work better than scaffolding up from fundamentals? This can be explained through constructivist educational psychology and gestalt psychology. Students are building knowledge out of their world, and the knowledge they are building are not built up blindly out of what is around them, the student first develops a vision or a goal or a gestalt for what they want to learn, and then they learn it. The vision might change as they learn more or their opinions or preferences change, but they need a castle in the sky to be building towards. And not just an intellectual blueprint, but a full personal schema that includes their feelings, hopes, dreams, preferences, and previous knowledge and personal history. If a curriculum is afflicted with elementitis and lacks this larger schema or gestalt, then no student will have been given the time and help to develop a clear vision for what they are learning and why. If we scaffold for interest, then we take that gestalt, that vision or goal, of what is to be learned seriously and put at least a version of it first. I hope this helps everyone :D Please share and vote up on Reddit — thanks!